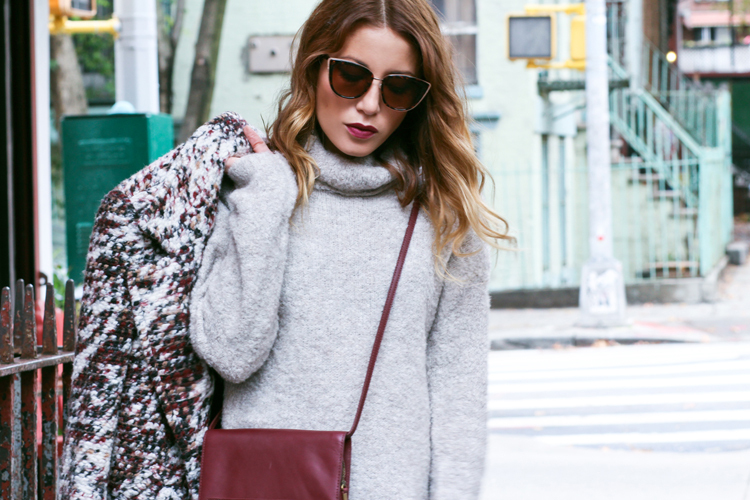 Stay sharp this Winter in a chunky sweater dress. See You Soon coat (similar here), ASOS funnel neck boucle knit dress, Hue tights, Madewell crossbody bag, Zero UV cateye sunglasses, And Other Stories booties. Shot by Isaac Lacey. We've all had those days when we wake up and find it impossible to devote any brain power to what we're going to wear. Days when all you want to do is stay in your pajamas or robe, bury yourself under the covers, grab a great book and get cozy. Well, I'm happy to say I've met your new wardrobe lifesaver: the sweater dress. For those of us that just can't seem to make pajama-dressing work, the sweater dress is your go-to, lazy-day uniform. It's pretty much like wearing a blanket around all day, only much more socially acceptable. It's also easier to slip on than a tee and a pair of jeans, keeps you super warm no matter the weather, and the best part is that it looks 5x more chic and put together. You can even add a belt to make it more streamlined. I'm loving the funnel-neck option I just scored above, but there are sooooo many to choose from in stores right now that it's almost impossible to not want to buy more. If there's one new trend you want to test out as we start to enter winter, I highly recommend this one! This look is so gorgeous :) I love everything about it. This sweater dress is fantastic! Love everything about your look; so polished! That knit dress is perfect! Love your coat and jacket!